The Hilton Box ... a winning modular guest room concept. The unique modular guest room was a winning concept by Toronto-based Chapi Chapo Design in a one-of-a-kind design competition. 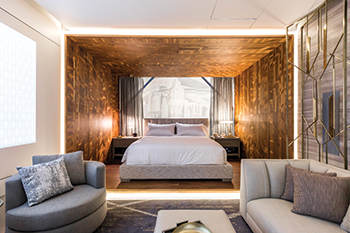 The competition was held by American multinational hospitality company Hilton Hotel and Hospitality Design Group in January 2018, which challenged 12 top design firms to create the ultimate luxury guest room in 24 hours for the Hilton Hotel, Las Vegas. Chapi Chapo Design winning presentation intertwined styles from the 21st century and trends from the 1920s. Admares built the winning guest room design using innovative modular technology. Resorts World Bimini was successfully completed by Admares with 269 pre-assembled hotel rooms using cutting-edge construction techniques. Admares technology has allowed for the majority of the building construction to take place away from the main construction site, with modules delivered to the site and installed in a nearly finished condition. By greatly reducing on-site construction, and thus the time to occupancy and producing a high quality product, Admares delivers valuable commercial benefits. Admares showcased The Hilton Box at the Hospitality Design Expo in Las Vegas in May (2 to 4).